World's most sophisticated analysis systems-the Ariel Performance Analysis and Computerized Exercise Systems. 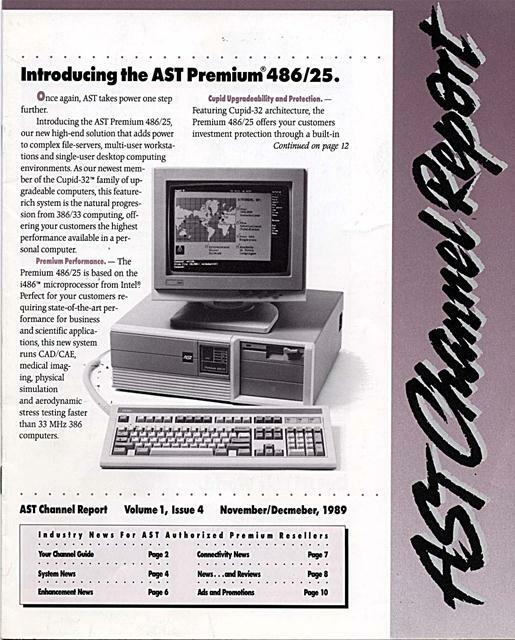 Introducing the AST Premium 486/25. environments. As our newest member of the Cupid-32'" family of upgradeable computers, this featurerich system is the natural progression from 386/33 computing, offering your customers the highest performance available in a personal computer. and aerodynamic stress testing faster than 33 MHz 386 computers. ï¿½	ï¿½ . . . . . . . . . The status of the Premium 386/16 has been changed to limited availability, due to our recent 386SX announcement and our commitment to focusing our product line for optimum positioning. This limited availability may result in extended lead times. Any outstanding Premium 386/16 bids can be shifted to the Premium SX systems, which offer your customers improved performance and the unique CUPID-32 upgrade architecture. AST Releases Enhanced MS-DOS 4.01 And OS/21.1. Now available for our entire line of systems products, we have released enhanced versions of MS-DOS 4.01 and OS/2 1.1. The new software provides customers with advanced operating system environments, enhanced performance, an improved user interface and an expanded array of features. ï¿½	Online Technical Support Goes International. ï¿½	be added to the existing U.S. and U.K.
ics, Inc. is a world leader in human performance analysis. 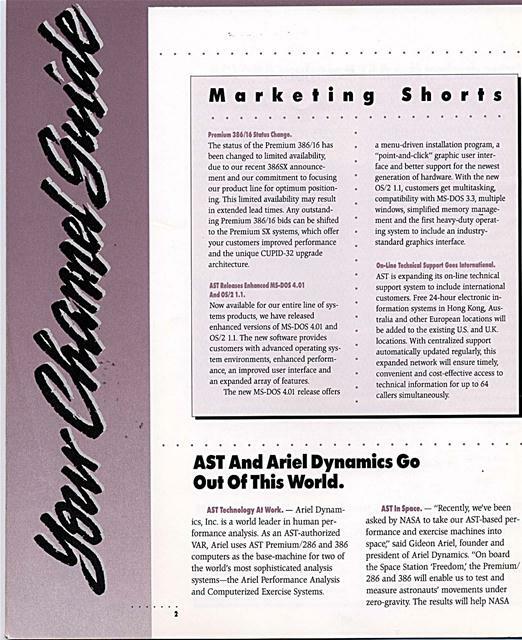 As an AST-authorized VAR, Ariel uses AST Premium/286 and 386 computers as the base-machine for two of the world's most sophisticated analysis systems-the Ariel Performance Analysis and Computerized Exercise Systems. engineers design a spacecraft control console that's most compatible for astronauts' body motion under extreme gravity fluctuations." Why AST? - "We chose the AST Premium/286 computers because of it's toprating, flexibility and reliability. It's an excellent computer. And I say this because we've dealt with all of them. AST computers are the easiest to work with, and they're reliable. This is important because we make our own customized boards and we're always working inside the computer. 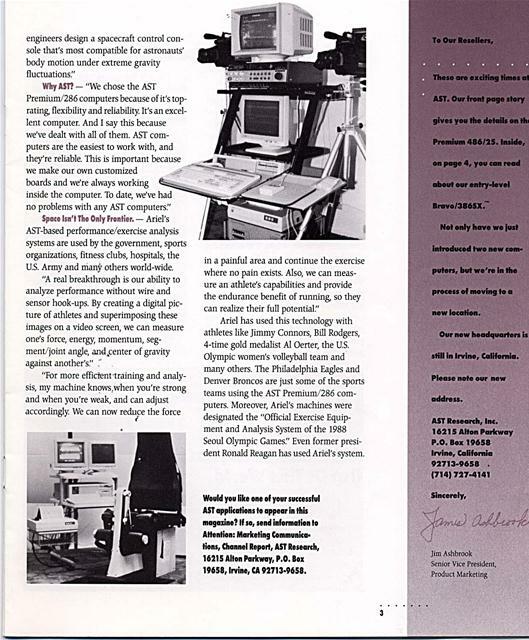 To date, we've had no problems with any AST computers"
AST-based performance/exercise analysis systems are used by the government, sports organizations, fitness clubs, hospitals, the U.S. Army and many others world-wide. "A real breakthrough is our ability to analyze performance without wire and sensor hook-ups. By creating a digital picture of athletes and superimposing these images on a video screen, we can measure one's force, energy, momentum, segment/joint angle, and center of gravity against another's." in a painful area and continue the exercise where no pain exists. Also, we can measure an athlete's capabilities and provide the endurance benefit of running, so they can realize their full potential." Ariel has used this technology with athletes like Jimmy Connors, Bill Rodgers, 4-time gold medalist Al Oerter, the U.S. Olympic women's volleyball team and many others. The Philadelphia Eagles and Denver Broncos are just some of the sports teams using the AST Premium/286 computers. Moreover, Ariel's machines were designated the "Official Exercise Equipment and Analysis System of the 1988 Seoul Olympic Games." Even former president Ronald Reagan has used Ariel's system. Not only have we just introduced two new computers, but we're in the process of moving to a new location. Our new headquarters is still in Irvine, California. Please note our new address. Would you like one of your successful AST applications to appear in this magazine? If so, send information to Attention: Marketing Communications, Channel Report, AST Research, 16215 Alton Parkway, P.O. Box 19658, Irvine, CA 92713-9658. Generated on 4/22/2019 10:58:03 AM (PST) ADI/HQ/GBA/2019/ARIELCLOUD/v3.0.2018.0126.